This afternoon, after a day watching Pete run circles around the lake (NINE miles), we decided to go check up on the boat. 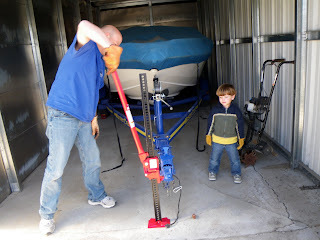 We knew we needed to replace the trailer jack when we parked it last year, so we went out prepared for work. Pete with his floor jack and Ben with his work gloves (just to prove to PA they do fit). He was stoked to have them and 'help' with the maintenance, but mainly he dug for big rocks. 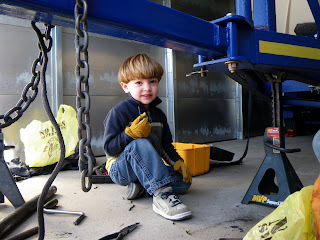 i LOVE them -- he looks so HANDY with them on -- very Tim the Toolman! !